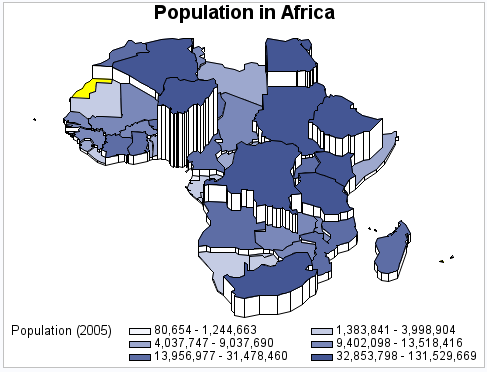 This example produces a prism map of the population of countries in Africa. Since the DISCRETE option is not used, the response variable is assumed to have a continuous range of values. Because neither the LEVELS= nor MIDPOINTS= option is used, the GMAP procedure selects a number of levels based on the number of map areas. It then calculates the appropriate response levels. Since the XVIEW=, YVIEW=, and ZVIEW= options are not used, the default viewing position, above and to the east and south of the center of the map, is used. Since the XLIGHT= and YLIGHT= options are not used, none of the side polygons of the prisms are shadowed. The light source is the same as the viewing position. Identify lake regions in the map data. Produce the prism map. The WHERE= clause in the MAP= statement excludes lake regions from the map. The ALL argument specifies that the output should include all of the map areas from the map data set, even if the response data set SASHELP.DEMOGRAPHICS does not include an observation for the map area. The output shows 1 such area. The ID statement specifies the variable in the map data set and the response data set that defines map areas. The CDEFAULT= option sets the color of map areas that have missing data. The RELZERO option makes the prism heights relative to zero.